Clara Louisa (1875 - 1918): Clara's original surname was Cockram, but her parents became Smiths when she was an infant, so she may never have known her real name. She and her husband Archie Adair had five sons, two of whom died in infancy, and Clara was well known in Indian Head for her affinity with the young people in the community. She often invited groups of children to her home for afternoon teas, parlour games and singsongs around the piano. She had a beautiful singing voice and was an accomplished pianist. After Clara died, Archie remarried and got involved in public life, serving for several years as the Mayor of Indian Head. Annie Maud (1877 - 1943): Maud was very involved in church activities and was a life member of the Red Cross Society, having assisted in many of the Society’s war efforts during WWI. She loved flowers and lace curtains, and once said that if there were no flowers or lace curtains in Heaven, she wasn’t going. She and her husband William George Bennett had two sons. 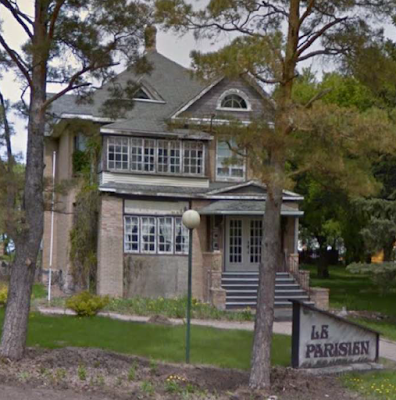 They farmed at Summerberry until 1920, and lived in nearby Wolseley after that. William served for some years as a Conservative MP for the Wolseley constituency. Their house in Wolseley was the setting for various family gatherings, and later became a French restaurant, and one of the heritage-listed buildings of the town. George Thomas Jr (1881 - 1936): When his parents moved to Regina in 1919, George took over the farm at Grand Coulee. He was highly respected as a fine person and an excellent farmer. It was said he could get a higher, better quality yield on his farm than anyone else in the district. He was a very big man, and must have looked massive in the buffalo coat he usually wore. He would often oblige his neighbours by riding to town with them, sitting in back of the buggy as a windbreak on very cold days. George had a rich bass singing voice but wouldn’t sing in the church choir. He never married, but was once engaged to a teacher. Frederick William (1883 - 1945): Will was also known as a fine farmer, and he took over some of his father's land near Summerberry when he married Aggie Fleming in 1907. He and Aggie had seven children, one of whom died at birth. In the 1920s, Will and Aggie bought a house in the town, where they spent the winters, and later they lived there permanently when their eldest son Morris took over the farm. Will was a well-known and highly regarded citizen of the district and and served on both the rural and Summerberry councils. His wife was also a prominent member of the community, and continued as such for many years after Will's death. Everyone knew her as 'Aunt Aggie' and she was involved in all sorts of sporting and church activities, and was the church organist for 73 years. She had a sunny smile and a youthful spirit all her life. When she was in her 80s, she fell and broke her hip, and couldn't understand how it happened - all she'd been doing was washing her foot in the sink! Will Smith and family, about 1927. Bessie Jane (1885 - 1978): Bessie married John Stewart (Jack) Fleming, and had two children. They lived all their married life in Indian Head, where Jack was a blacksmith. 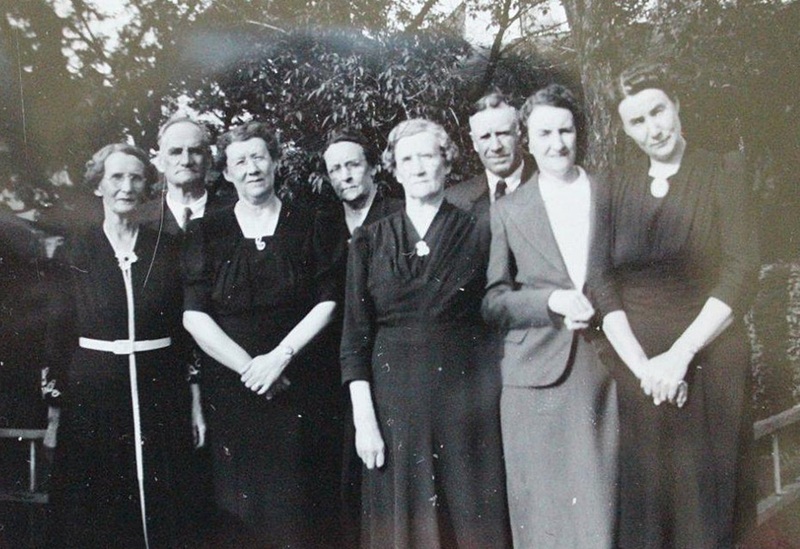 Bess was very active in her church, as well as the United Church Women's group and the Red Cross. After Jack passed away in 1942, Bessie stayed in her home for many years, until she moved into the Golden Prairie Home. When she was 90, she was still able to recite a poem her father had taught her in childhood. She died at 93 and was buried with Jack in the Indian Head cemetery. Elizabeth Grace (1886 - 1974): Grace loved to sing, and was a mainstay of the church choir at Grand Coulee. She married Andy Mowat when she was in her early 30s, and they moved to a farm near Sintaluta, and had two children. Then when her widowed brother-in-law Archie Adair moved into Indian Head in 1923, Grace and Andy rented Archie's farm at Rose Valley, where they stayed for 33 years. They retired to Indian Head, and celebrated their 50th wedding anniversary there in 1968. Grace passed away six years later, at the age of 88; Andy lived to 101. Both are buried at Indian Head. 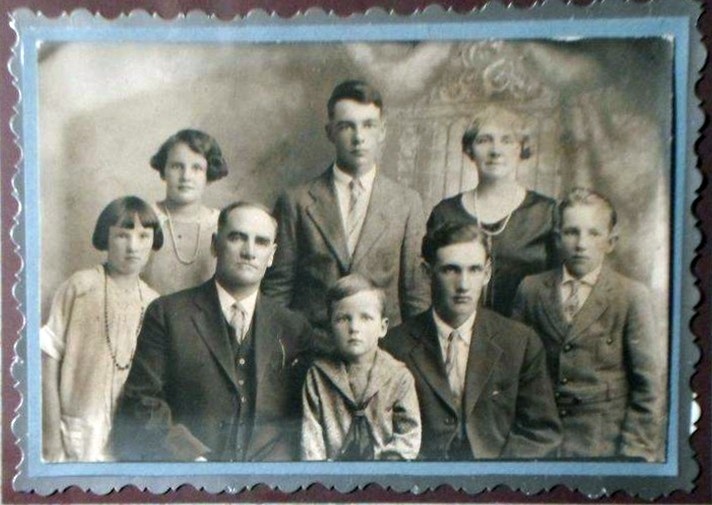 Herman Ryley (1891 - 1962): My grandfather was a gentle and kind man, and quite shy as a youngster. My grandmother remembered that shortly after the Smiths moved to Grand Coulee, when Ryley was about 16, the young people of the area were skating at the the outdoor rink. Ryley was too shy to join them, and stood and watched from outside the boards, with his skates over his shoulder. But he, like most of his siblings, was a member of the church choir, as was Myrtle Wanamaker, who became his wife. They farmed at Summerberry and had eight children. I'll go into more detail about them in later posts. Prudence Irene (1893 - 1993): When Prue married Roy Wanamaker in 1915, they moved to a farm in the Sherwood district near Regina, where they lived for 50 years. Prue was well known for her beautiful handwork - knitting, crochet and needlepoint - and for her talent at cooking and baking - fluffy scones were her specialty. She was equally at home helping bring in the harvest, working in her garden, caring for the horses or pouring tea from a silver tea service. Prue shared her family's love of music, and was the church pianist for many years. She was very active in the church and was awarded a lifetime membership in the United Church Women's group. Roy worked as a telephone linesman as well as running the farm. He was an avid hunter, and did beautiful woodwork on his lathe. He was also active in the church and served on the church board. They retired to Regina, and celebrated 75 years of marriage before Roy passed away in 1990, and Prue in 1993. Both are buried in Riverside Memorial Gardens in Regina. 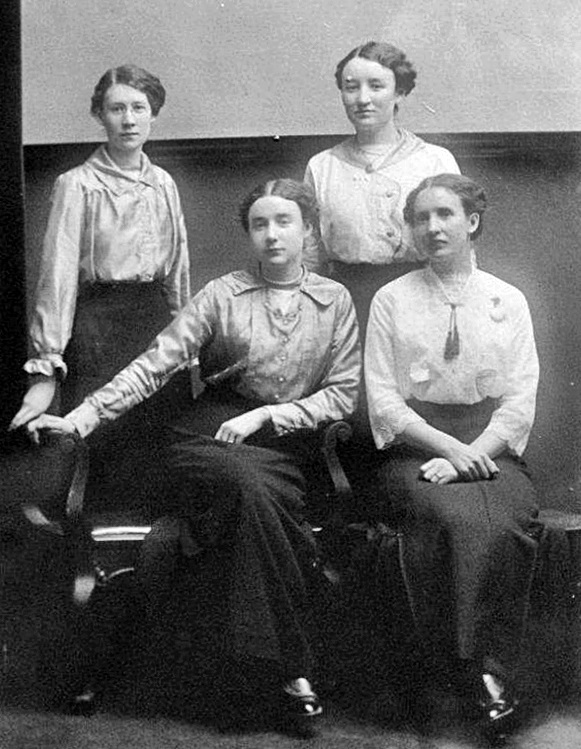 Four Smith sisters, about 1919. Beatrice Ethel (1897 -1997): Ethel met and married Frank Burton in Grand Coulee, and the two of them farmed there for awhile before moving to another farm to the northeast of Regina. Like her sisters, Ethel loved flowers, singing and playing the piano. She was an accomplished homemaker and helped with the harvest. She and Frank were both active in their churches, from Grand Coulee to their retirement in Regina. After Frank died in 1981, Ethel lived in the Pioneer Village Nursing Home in Regina, where she passed away in 1997, just a few months short of 100 years. Audrey May (1899 - 1991): Audrey moved to Regina with her parents in 1919, where she became a member of the United Church Women's group. She nursed her mother when she had cancer, and after Louisa's death, Audrey cared for her father until he passed away in 1943. Two years later, when she was 46, Audrey married widower Harry Hardy, a superintendent with the National Grain Co., and they lived in her house in Regina, which George had left to her in his will. Shortly after her marriage, Audrey was diagnosed with multiple sclerosis. She wore a brace on one leg, walked with sticks, had her car outfitted to accommodate her needs and was never known to feel sorry for herself. She had a sharp mind and kept it busy with reading, doing crossword puzzles, keeping up with the news and enjoying lively conversations with friends and family. She did embroidery, loved flowers and had a fine singing voice. After Harry died in 1958, Audrey moved into an apartment, and when she was unable to care for herself any longer, she moved into a private care home. Her long, brave battle with MS came to an end in 1991, and she was buried with her parents in the Regina Cemetery. Louisa (Lucy) Murphy Cockram Smith (1855-1928): Louisa was known to her friends and family as Lucy for most of her life. She loved flowers and handcrafts, and passed her gardening and needlework skills on to her daughters. She had few idle moments, and rarely sat down without picking up her knitting. She had a great fondness for Ireland and often spoke of her Irish heritage. She was a shy, quiet person who was happiest at home, and was well-loved by her husband, children and grandchildren. George Cockram / George Thomas Smith (1851-1943): I've already said a lot about George, but I'll just add a few more words. George was a great reader - mainly he read poetry, newspapers from England, and his bible. He had very bad asthma, and would often read late into the night when he was unable to sleep. He taught his children to recite poetry, encouraged them to sing, and had a beautiful singing voice himself. He would often sing to Lucy, especially her favourite song, 'I'll Take You Home Again Kathleen'. He and Lucy must have had a wonderful marriage - the example they set shows in the extraordinary marriages their children made.